SOLD but I have more forest paintings on my website, see link below. These magnificent Sequoia redwoods are growing in the Armstrong Grove in Northern California, not far from Guerneville, which is on the Russian River. It is an old growth forest, protected, and will never be cut down. I love being in the redwoods and I love painting them, too. They impart a certain feeling of peace, grandeur and spirituality that is almost overwhelming. I try to capture the feeling of being there in every redwood painting that I do. Let me know if you are interested in a redwood theme in perhaps a larger size. 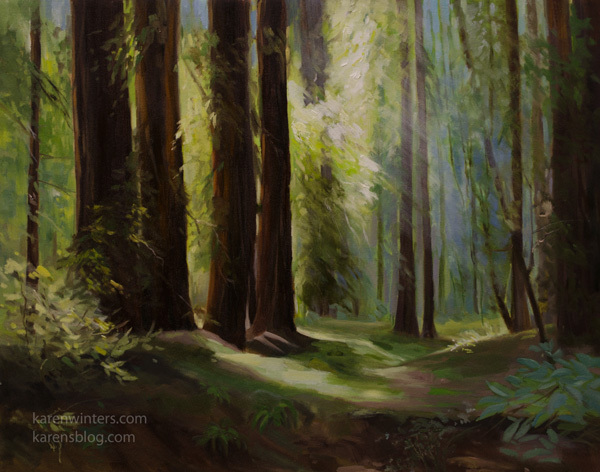 I do a lot of painting on commission, and the redwoods are one of my favorite subjects. Absolutely, stunning, Karen. Just takes my breath. That filtering light, drifting down from such a height.